Press and post-press specialist Bobst is to launch a new digital print division targeting packaging and labels. The company, Mouvent, is for digital printing and products in the packaging and labelling sector. Bobst hopes that the new arm would be a “a revelation in the packaging industry”. Radex is a start-up company, specializing in DOD inkjet digital printing. This competence is central to digital developments at Mouvent, with the digital printing technology developed by Radex, which is based on a highly integrated ‘cluster’, at the heart of new machines being brought to market by Mouvent for labels, flexible packaging, corrugated board, folding carton, textiles and more. "Our radical new approach is to use a base cluster which is arranged in a modular, scalable matrix instead of having different print bars for different applications and different print widths," explained Piero Pierantozzi, co-founder of Mouvent. "The Mouvent Cluster is the key technology behind the Mouvent machines, resulting in high optical resolution for a crisp, colorful, very high printing quality, as well as a never-seen-before flexibility and possibilities in terms of machine development. Simplicity is our engineering philosophy." Mouvent printers have a compact design and small footprint, and are claimed to be the smallest digital printers in their category. The system, which is also modular, allows easier settings and start-up with less fine adjustments required resulting in a productivity boost, the company said. 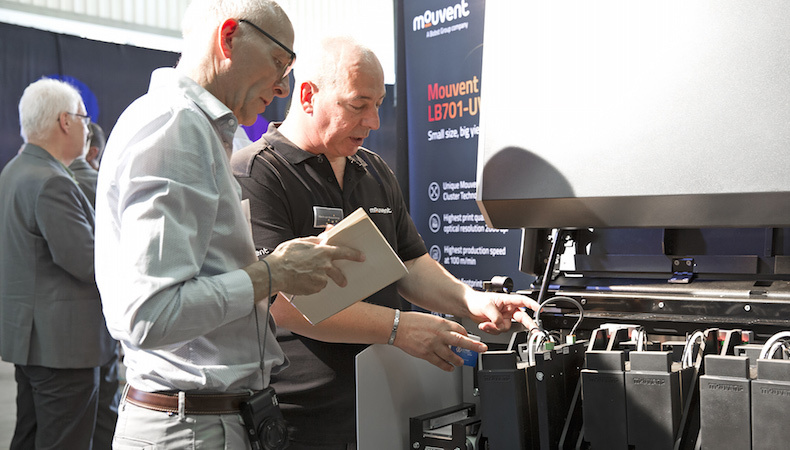 As well as digital printing presses, Mouvent offers a fully integrated, complete ecosystem. The company develops, engineers, tests and industrializes digital printers based on the Mouvent Cluster; it writes the software around the printers; develops inks and coatings for various substrates; as well as providing a full servicing offering. As a result, the company is promising a new standard in inkjet label production cost and quality, in ink pricing, head durability, quality and machine performance. "We are very excited to start rolling out the pipeline in the months ahead," said Mouvent CEO Simon Rothen. "Today is the announcement of an exciting journey of bringing large-scale digital printing to various industries." "The digital printing solutions offered by Mouvent will present new opportunities for all sorts of companies, bringing more flexibility, unmatched productivity, shorter time to market and infinite variation, all with a very compact and energy efficient design. This will revolutionize the digital printing world." CEO Bobst Group Jean-Pascal Bobst commented: "We truly believe this is a watershed moment for the future of digital printing independent of the industry or market." "Current industry trends – including high demand for digitalization, short runs, fast availability, promotion and versioning, personalized and seasonal products, and increasing sensitivity towards cost and environment – are driving demand for high quality and affordable digital printing machines." "Through Mouvent we aim to initiate a quantum leap in this area, ultimately providing the market with what it needs most; highly reliable industrial digital printing on different substrates at a competitive cost."